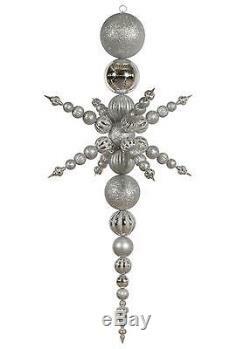 Vickerman - 76 Silver Commercial Shatterproof Radical Snowflake Christmas Finial Ornament. International Customers: All electronic products are packaged for sale in the US with US voltage. This item is brand-new, factory sealed. Huge Shatterproof Snowflake Christmas Finial Decoration Item #N103707. This very unique hard to find item is perfect for commercial decorating! Onlookers will be amazed by its size and beauty Shatterproof ornaments combine the beauty and luster of real glass with the unbreakable practicality of plastic. Additional product features: Commercial sized Color: silver Finish: shiny matte and glitter Some assembly required Recommended for indoor use only - if using outdoors place under a covered area Fully dimensional ornament Comes ready-to-hang on a silver metal hook. Dimensions: 76"H x 34"W Material(s): durable plastic. We focus on making purchasing online a pleasant experience. Why are our prices so low? We have modeled our business much like a wholesaler. We sell in huge volume and have streamlined our operations to provide you with the best combination of price and service available anywhere. The item "Vickerman 76 Silver Commercial Shatterproof Radical Snowflake Christmas" is in sale since Tuesday, June 13, 2017. This item is in the category "Home & Garden\Holiday & Seasonal Décor\Christmas & Winter\Ornaments". The seller is "beachaudio" and is located in United States. This item can be shipped to United States, Canada, United Kingdom, Denmark, Romania, Slovakia, Bulgaria, Czech republic, Finland, Hungary, Latvia, Lithuania, Malta, Estonia, Australia, Greece, Portugal, Cyprus, Slovenia, Japan, China, Sweden, South Korea, Indonesia, Taiwan, South africa, Thailand, Belgium, France, Hong Kong, Ireland, Netherlands, Poland, Spain, Italy, Germany, Austria, Russian federation, Israel, Mexico, New Zealand, Philippines, Singapore, Switzerland, Norway, Saudi arabia, Ukraine, United arab emirates, Qatar, Kuwait, Bahrain, Croatia, Malaysia, Brazil, Chile, Colombia, Costa rica, Dominican republic, Panama, Trinidad and tobago, Guatemala, El salvador, Honduras, Jamaica, Antigua and barbuda, Aruba, Belize, Dominica, Grenada, Saint kitts and nevis, Saint lucia, Montserrat, Turks and caicos islands, Barbados, Bangladesh, Bermuda, Brunei darussalam, Bolivia, Ecuador, Egypt, French guiana, Guernsey, Gibraltar, Guadeloupe, Iceland, Jersey, Jordan, Cambodia, Cayman islands, Liechtenstein, Sri lanka, Luxembourg, Monaco, Macao, Martinique, Maldives, Nicaragua, Oman, Peru, Pakistan, Paraguay, Reunion.